In the distance we could see the old town, looming on a cliff above us. Our taxi circled the perimeter of the town, choosing streets to turn down, only to arrive at a dead-end or a one-way. On more than one occasion, the city map was consulted by our driver, while he mumbled in Bulgarian, trying to find a way to penetrate the ancient walls. Eventually we gave up and decided to walk, rather than drive. The taxi driver felt awful for not being able to get us to our destination, and he didn’t charge us the price on the meter. However, we still decided to give him some money, but the gesture was indicative of what we would experience during the next 5 nights in Plovdiv. We hoofed it up steep cobblestone streets, which was made easier by the fact that we had no luggage. The airline had lost it en route to Turkey – maybe it was in Puerto Rico where we started our journey, perhaps our layover city of New York, or maybe it was in Istanbul? Who knew, all we knew was that at that moment, we were happy to only have our day packs. The little lanes zigged and zagged in all directions, and the high walls made it difficult to see anything up ahead. Seeing our confused faces, a man came over and helped us find our hostel. In fact, he actually walked us right to the door. From the outside, the Hostel Old Plovdiv was stunning, with its yellow exterior, ornate wooden columns, and beautifully decorated facade. As we entered the 150 year old home, we were in awe of the high ceilings and wooden floors. Greeting us was a welcome sign! In all of our years of backpacking around the world, never has a hostel had a personal sign for its visitors – a very nice touch indeed. 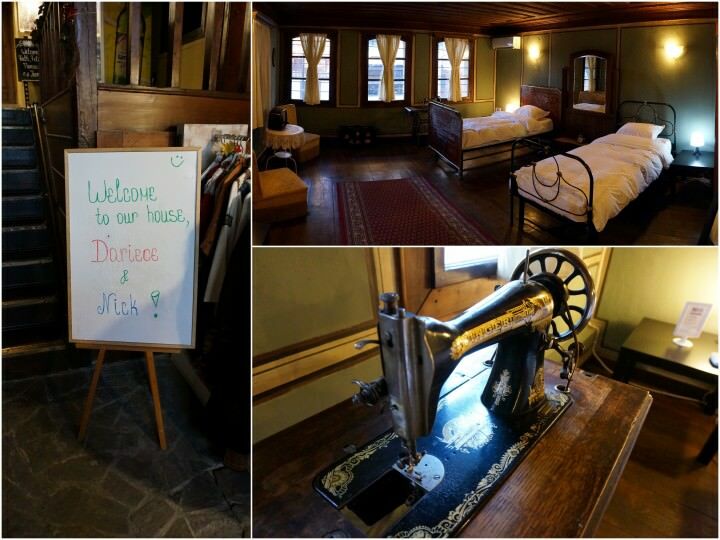 The lovely Hostel Old Plovdiv – we couldn’t get over the personalized sign! Even though this accommodation is considered a hostel, it’s more like a boutique hotel (which we love), and the prices are extremely fair (10 Euros / person / night, including a huge breakfast). Originally owned by a rich tobacco farmer, this home is somewhat of a museum. While many of the homes from this period have been converted into shops or restaurants, Hostel Old Plovdiv offers guests a glimpse of what households were like in the 1800’s. The elegant ceilings and antique furniture is lovely, but what really impressed us was the stone wall from the Roman period in the basement! 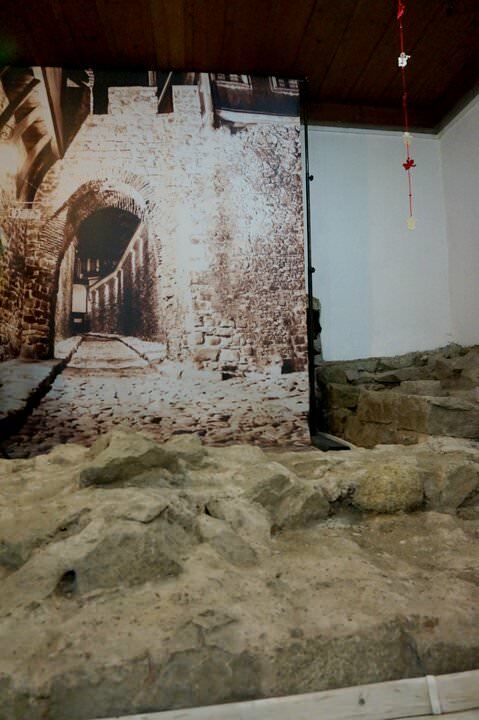 A portion of a Roman wall in the basement of the hostel! There’s just something about old towns that we’ve always been drawn to, and Plovdiv’s was no exception. Just steps from the hostel we could visit a museum, church, art gallery, Roman ruins, and the Rahat Tepe tavern – which we ended up frequenting quite often! A short walk brought us to the main pedestrian street, which is a feature that all cities should have. 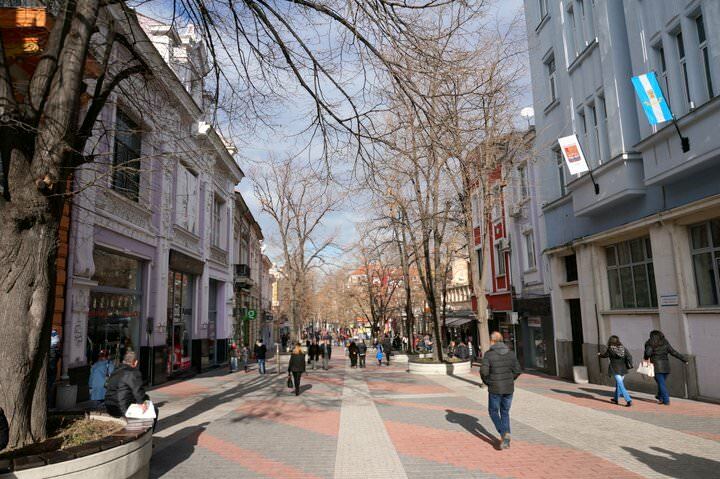 Knyaz Aleksandar I is the longest pedestrianized street in all of Europe, spanning 1.7 kilometers. This was an excellent spot for shopping, people watching, having coffee, and checking out the 240 meter long Roman stadium, which has been partially excavated. As Canadians, seeing ruins from the Roman period in the basement of our hostel, scattered along a ridge of the old town, and in the center of the city was pretty incredible. In Canada, the oldest structure we have is from the early 1600’s, while the country of Canada itself wasn’t founded until 1867! The partially excavated Roman stadium right in the middle of the pedestrian street! We joined a free walking tour with some other backpackers which was a great way to get our bearings in the city. 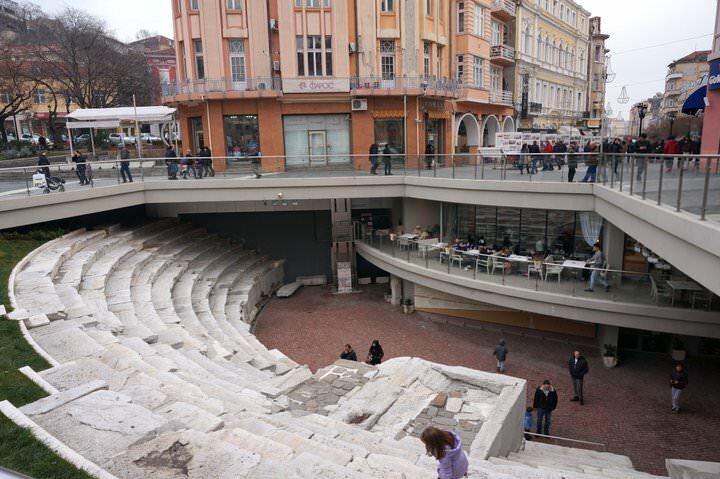 We enjoyed the Bulgarian revival architecture, the up-and-coming neighbourhood “the Trap”, and seeing the incredible Roman amphitheater, which is actually still used for various performances. The surrounding countryside has 40 wineries with local varieties of grapes, which only grow in Bulgaria. Even though we took a wine tour during a chilly January day, it was still stunning, and I can’t even imagine how beautiful the vineyards must be in the spring and summer. The Thracian people (you’ve probably heard of Spartacus?) were from Thrace, an area found in present day Bulgaria, Greece and Turkey. They were excellent wine makers and it’s said that the first vines in Europe were brought by Thracians from the Middle East and planted in what is now Southern Bulgaria. The first winery on our tour was Starata Izba Parvenets, with a gorgeous 19th century estate draped in vines. We sampled wine straight from the Bulgarian oak barrels in a 130 year old cellar! This was one of those “I can’t believe what we’re doing” moments in travel. At the entrance to the Starata Izba Parvenets Winery, gorgeous! The second, and final, winery we checked out was the more modern Villa Yustina, set on a gorgeous property. 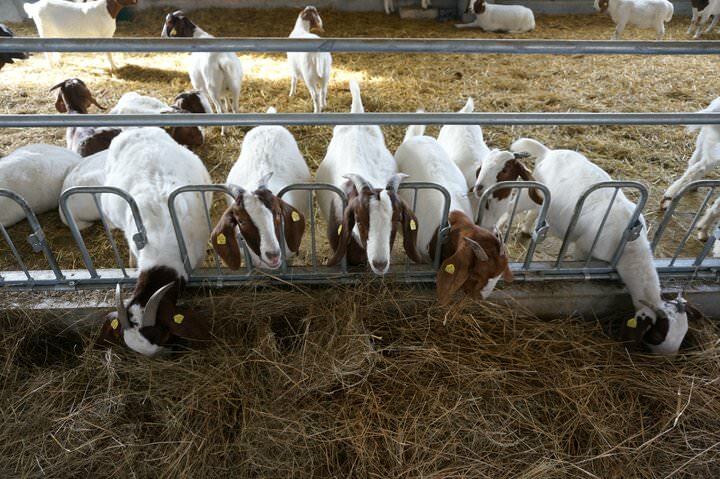 We Goats were able to get a sneak peek into the goat pen – they were so cute! We also sampled a wide variety of wines which were grown, aged and bottled right on the estate. Even though we really enjoyed the goats and wines on offer here, we loved the fact that we were able to experience wine pairings with food. A platter of cheese, meats, bread and blueberry jam was available for us to eat – which was good, as we had about 6 tastings by this point (and the “tastings” were more like full sized glasses). The wineries were completely different from one another, and we had a unique and excellent experience at both of them. 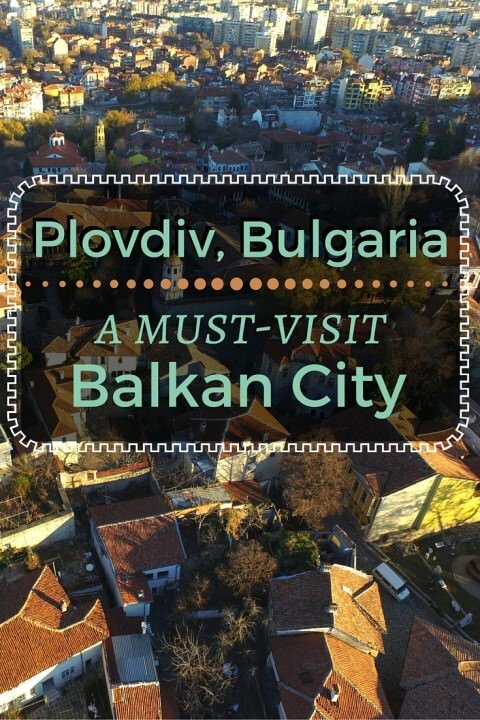 Plovdiv checked off all of the boxes when it comes to what we look for in a destination. There was wonderful history, great food, beautiful scenery, fascinating architecture and the people were extremely friendly and welcoming. 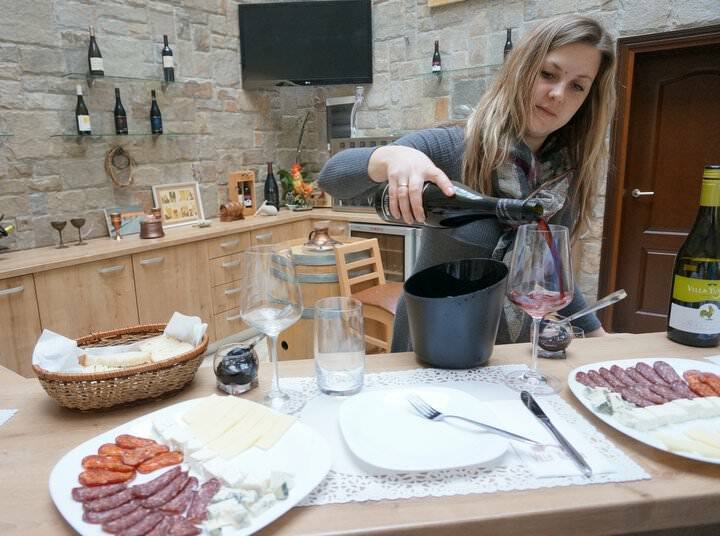 We actually became friends with the owners of Bulgaria Wine Tours (Vasil and Zina). They even took us out on a bit of a pub crawl! Us with Vasil of Bulgaria Wine Tours – thanks for a great day! Everyone else we encountered was genuine and didn’t treat us like foreigners or tourists. We felt like friends with so many people in this city. We were also randomly interviewed by a journalist at one of the pubs, check it out here. The restaurants were excellent and we loved sampling the local Bulgarian food (Nick has discovered he really likes duck heart!) 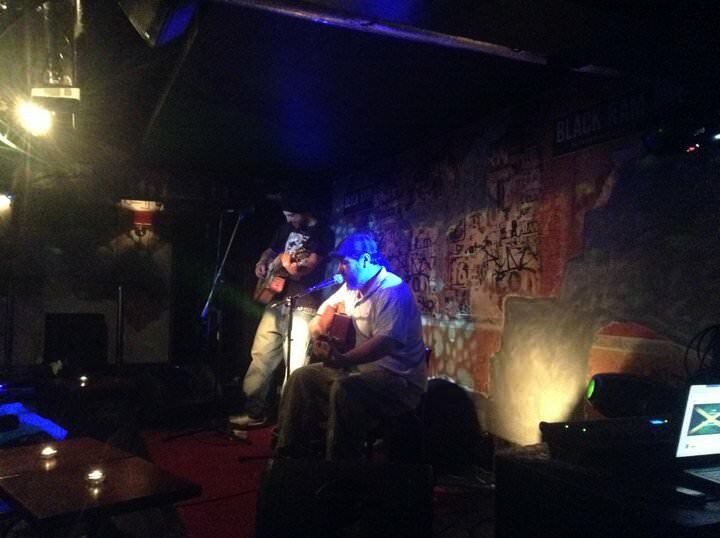 For entertainment, the pubs were a lot of fun, and thanks to our friend Jazza, we were able to find some awesome live music as well… in the basement of a bar. The live music was awesome! 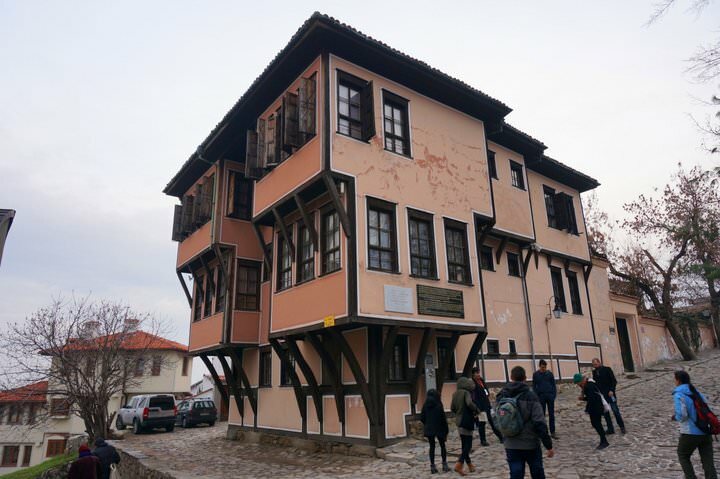 The history was mind-blowing, our accommodation was incredible and the overall vibe of the city was super “aylak” (the Plovdiv word for relaxed). This is somewhere we would love to return to in the spring, and it comes as no surprise to us that Plovdiv has been listed as the European Capital of Culture in 2019. On top of all of this, the cost of travelling in Plovdiv was of a very good value. In a restaurant, meals were between $3 – $5 for a large plate of food, local beers were around $1 and .5L of wine was $2.50. Taxis were also very affordable (they actually use the meter! ), and the cover charge for the live music was $1. There was something about Plovdiv that made us want to linger. 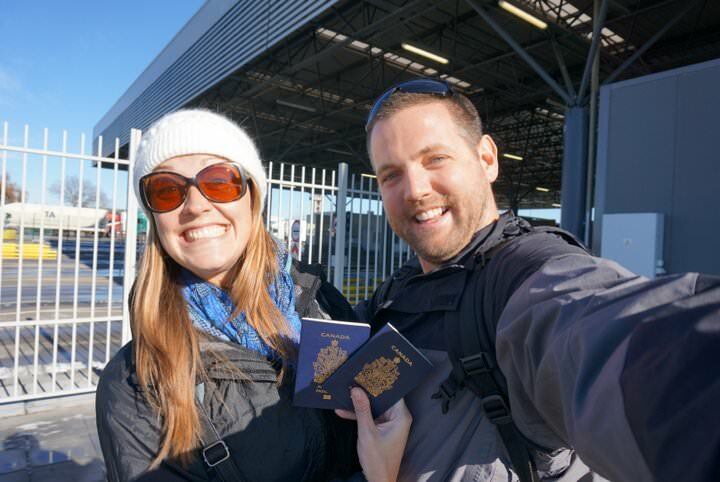 This was the first stop on our Eastern Europe backpacking trip, and we instantly wanted to stay put! But, we needed to keep moving and explore more. Stay tuned for our upcoming adventures in this part of the world. A big thank-you to Hostel Old Plovdiv and Bulgaria Wine Tours for hosting us during our stay in the city, we had a great time! As always, all thoughts and opinions remain our own, despite any complimentary services received. We really enjoyed Plovdiv. I had no idea it had so much Roman history until we arrived. The free walking tour there is a great way to orient yourself. We were there in the summer and they have Opera in the old Roman Ampitheatre overlooking the town. It was fantastic! I hope you guys enjoyed Plovdiv! Were you able to find any vegan spots? Good stuff and looking forward to seeing where you go in the coming weeks. My husband and I are planning on spending a few weeks in the region in April. Quick question: Did you take a bus from Istanbul to Plovdiv? If so, which bus company did you use? I’ve been looking on line and it seems there are a couple companies that travel that route, but wondering if you recommend the one you used. Was it about 6-7 hours? That’s an impressive hostel it looks more like a B&B! 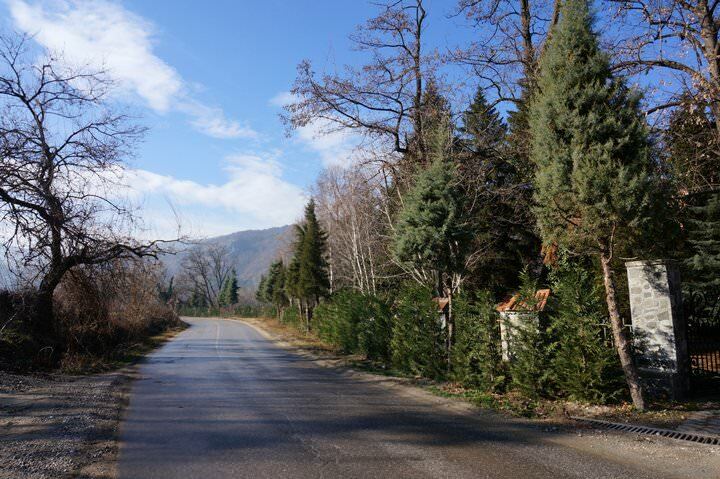 Plovdid looks like a great place to explore and very easy on the budget which is always a bonus. To be honest, we didn’t really find Bulgaria that interesting, especially when compared with all the other Balkan states, but Plovdiv was definitely the best place in the country! The cobblestones streets and the lovely architecture was much to our liking, but I guess it’s not the same place now as we visited it nearly 9 years ago. Your hostel looks amazing, too! Interesting that you didn’t really find Bulgaria all that interesting. We only went to Plovdiv and Sofia, and much preferred Plovdiv! I wonder what you would think now, 9 years later! 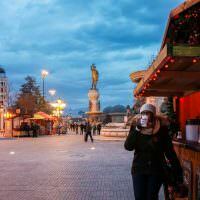 It’s definitely great value for money – in fact, we’re finding that all of the Balkan countries are! How cool is a personalized sign?! 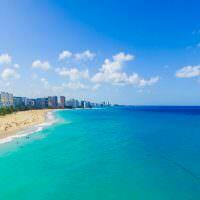 Definitely will bookmark this article to know where to stay once I make it to Bulgaria. Sounds like you had a great time. I also love old cities, they just have an awesome flair and I love to walk through the old streets and think of how people in past times lived there. Thanks Kathrin 🙂 The personalized sign was a nice touch for sure. Wow really does sound like one of those places where your money goes further than anywhere else. 10 Euros / person / night, including a huge breakfast?! That’s amazing for that quality of a hotel!! Sorry to hear that the airline lost your bags. But glad you had a fab time! I’m also absolutely drawn to historic towns and I love exploring because they’re all so unique. That’s so nice the taxi driver said he wouldn’t charge you at all! Sorry about the luggage, but I can see where that would be one situation where it was nice to have a lighter load! That’s so cool that there are ruins right in the middle of the city like that–I love learning the history of places like this. Plovdiv definitely sounds like a wonderful destination, and the prices make it even better! Will have to add it to our list for sure! Thanks for the comment Jenna 🙂 Plovdiv is awesome. Awesome! I’ve never been here, but it looks incredible! I loved the partially excavated ruins. Such a contrast to the modern city. It’s really neat to see that! Thanks for stopping by Joe 🙂 Happy trails! get to Croatia! spent 2 months working and travelling around and its a beautiful place!! Looks like an interesting place! I must admit that Bulgaria is a bit of a blank in my mind – but this is quite impressive! I was in Plovdiv couple of years ago and really enjoyed it. It was such a pleasant surprised, I especially loved the architecture there. Last year I visited Veliko Tarnovo and it was even a bigger gem than Plovdiv, you should go there if you have a chance too! great article! I follow your blog mainly because you have opened my eyes to so many travel destinations that I would not have otherwise considered. The history is what draws me….ultimately, you can probably get a great meal with a strong beverage just about anywhere. While the food is important, what I love MOST is the way the historical architecture was excavated and incorporated into modern infrastructure. Thank you for the comprehensive overview! Thank you for following our journey Liz 🙂 We really appreciate it! I agree, food and people can be great everywhere, but for us it’s the “feel” of a place, and we do love history as well! Really?! I’m so surprised to hear that (honestly). We’ve been to Bulgaria, Macedonia, Albania and Bosnia so far and everyone has been so friendly and very welcoming. Check it out! The “revival style” architecture looks fun and impressive! Also, the countryside surrounding the wineries. Do you have any hiking planned? Plovdiv is beautiful. it’s so underrated!! Found your blog whilst searching for Villa Yustina winery (going tomorrow). Hope your luggage turned up eventually! We’ve been in Bulgaria for only 6 nights – but what a great place! Recommend hiking next time you visit – Rila & Rodophe mountains. Amazing scenery and friendly people. Thanks for your insights & happy travels! Thanks Francine! Enjoy Villa Yustina 🙂 We did eventually get our bags! haha. Your travel experiences are terrific, I’m going to Bulgaria in May and shall certainly do the walking tour and hopefully the winery one too!